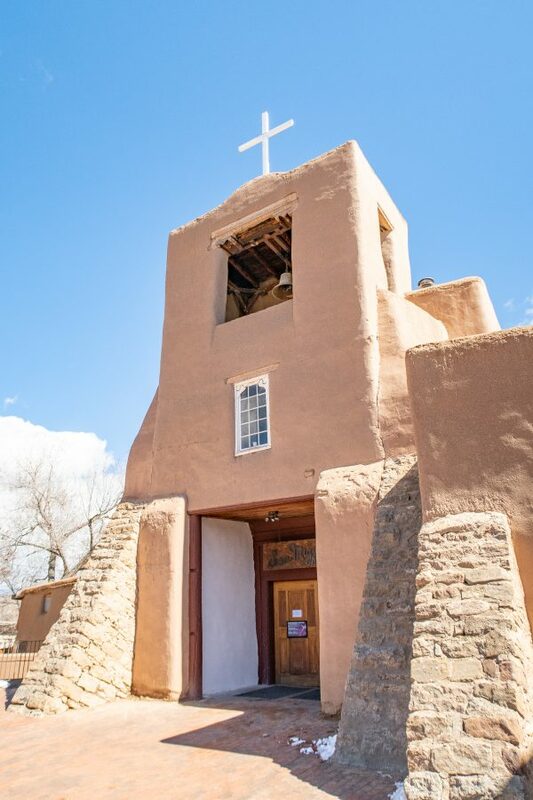 A guide of what to do in Santa Fe – a stunning small city with bright blue skies, adobe architecture, and views of the Rocky Mountains. Before I visited Santa Fe, two things would come to mind when I heard the city’s name. The first was the Georgia O’Keeffe Museum, which makes sense considering the fact I studied art history and love her paintings. The second is a bit more obscure and doesn’t have much to do with Santa Fe, but growing up my siblings and I loved the film Newsies, and the lead character, Jack Kelly, played by Christian Bale, dreamed of moving to Santa Fe. Jack sang: “Just a moon so big and yellow, it turns night right into day. Dreams come true. Yeah they do. In Santa Fe.” It’s a convincing sales pitch that stuck in my head. 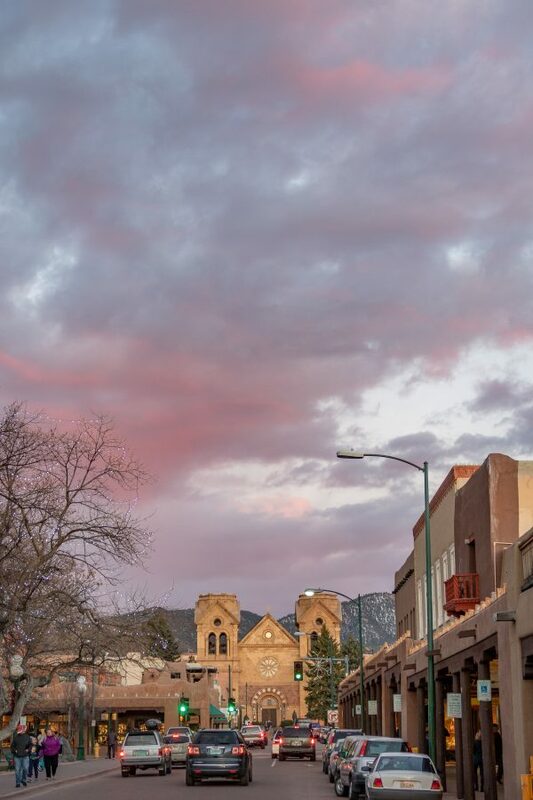 The moon wasn’t so bright that it turned the night into day, but Santa Fe offers activities for art lovers, history buffs, and people who love the outdoors. I had high hopes, and they were met. I loved the museum. The first room walks visitors through a timeline of O’Keeffe’s life and career while putting it all in context with world history. Did you realize that she lived to be 98? Events including the Wright Brother’s first flight, women gaining the right to vote, the Great Depression, two world wars, and the moon landing all took place during artist’s lifetime. 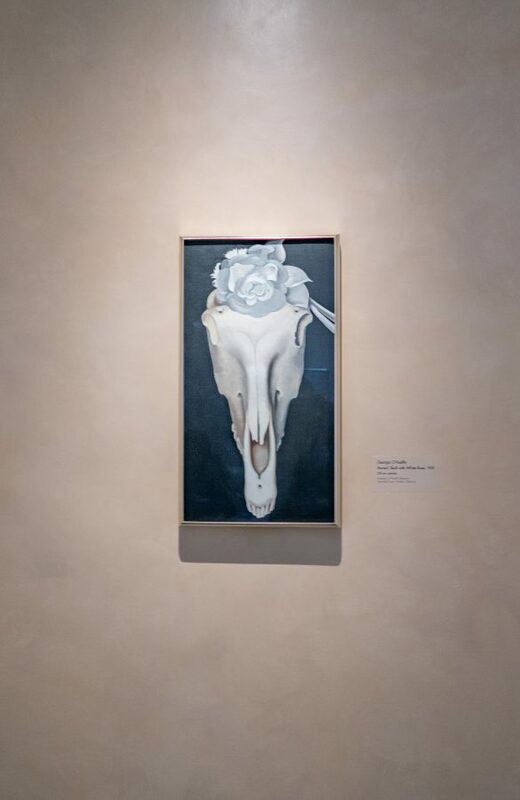 O’Keeffe was getting her start just as Picasso’s work was first being exhibited in America. Once you learn about the artist, you get to explore several galleries of her paintings. 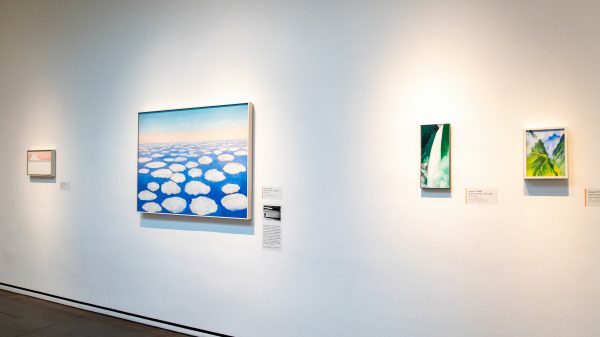 The collection spans O’Keeffe’s entire career, from her years spent as a college professor to her time painting New York City skyscrapers to her more abstract New Mexico works. Being in Santa Fe gave me a deeper understanding of the work O’Keeffe created while living in New Mexico. The crystal clear blue skies, clouds, and adobe buildings look just as they appear in O’Keeffe’s paintings. What can easily be mistaken for abstraction is just a way of looking at what it actually there. Charles went into the museum unaware of who Georgia O’Keeffe was (shocking considering the half a dozen books about her on our bookshelf). He enjoyed the museum and was surprised by how her work became increasingly abstract. The size of the museum makes it easy to explore in just an hour to two, which works well if you are with someone who isn’t keen on spending entire days in a museum. This is the most popular attraction in Santa Fe. It’s a series of interactive art installations tied together by a mystery story. 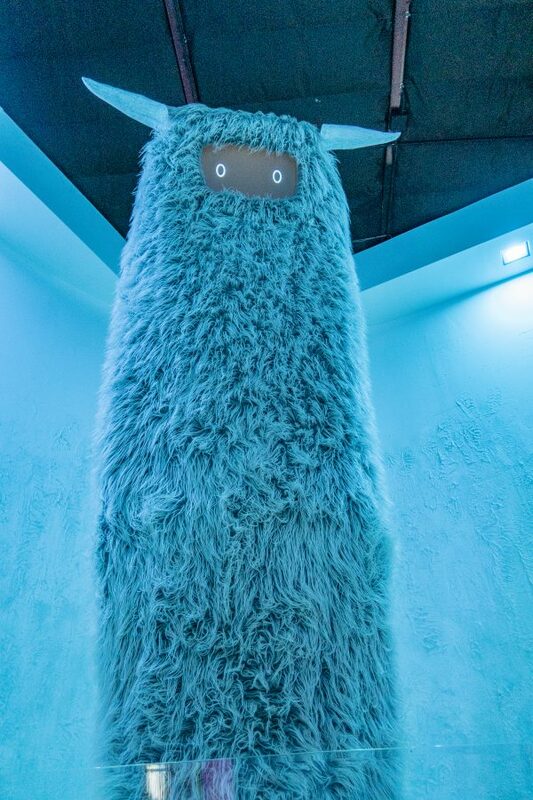 It’s a choose your own adventure story meets art exhibit meets funhouse. It’s a little out there and hard to explain. I also don’t want to ruin anything for you by saying too much. You should definitely book tickets in advance, we had to wait over 90 minutes to get in. Even if you do book tickets, you might be waiting up to an hour in the will call line to get in. 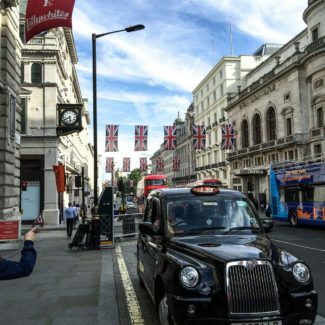 I recommend going at night if you can, I hear it is less busy after 4:30. We went during the day and there were young kids running around everywhere, which made the experience less enjoyable. 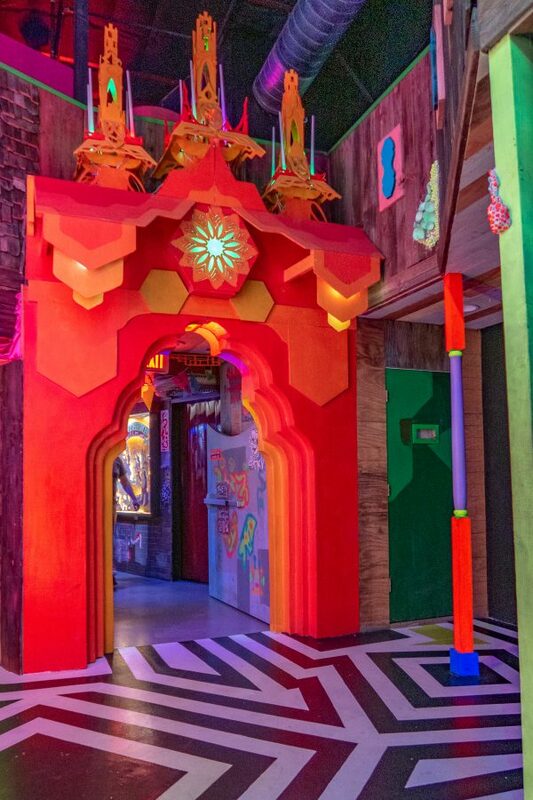 Visitors to Meow Wolf can opt to try and piece together the mystery or to just enjoy the art installations. I will say that the story didn’t come together as clearly as I had expected. We did thoroughly enjoy the Meow Wolf experience and I highly recommend it. If you want to be a bit more casual about visiting, 2 hours is enough. 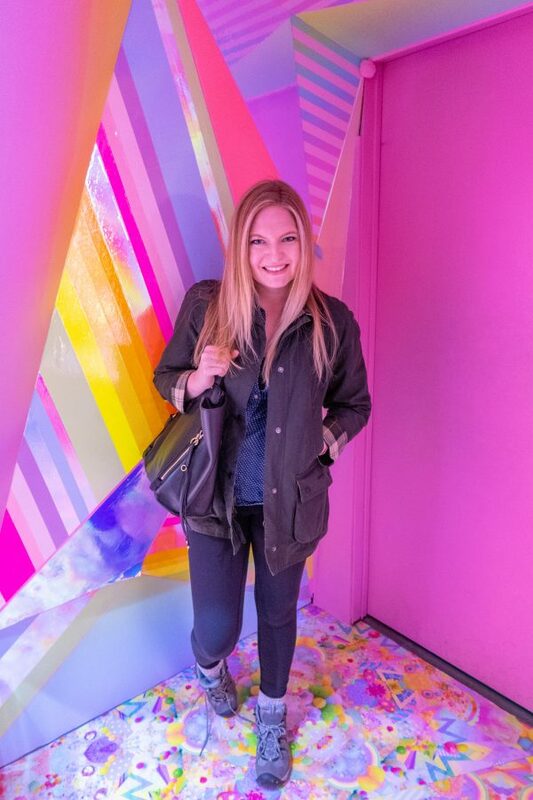 If you want to dig through every detail of the mystery, some people spent upwards of 7 hours at Meow Wolf. 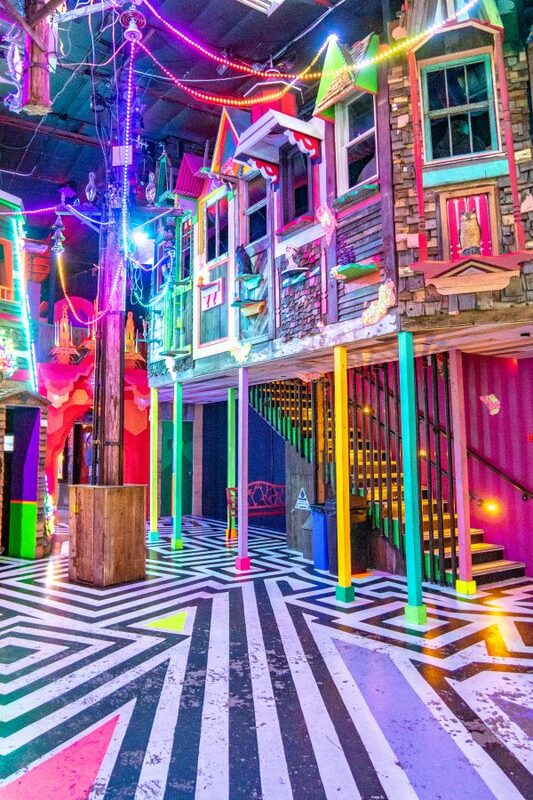 Lastly, Meow Wolf is also a concert venue, and I think it would be a really amazing place to see a show. 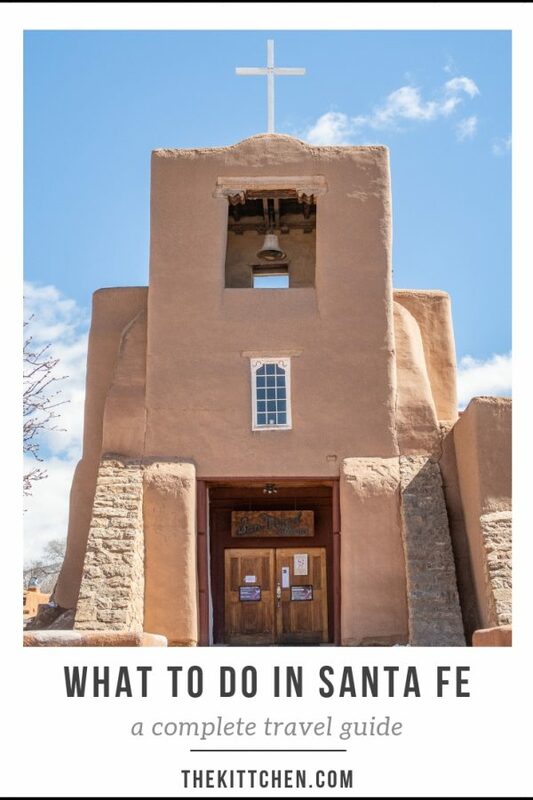 I was surprised to learn that Santa Fe is the oldest continuously occupied city in America. Once I learned that it made sense that the city is home to both the oldest home and oldest church in the country. The De Vargas Street House rests on the foundation of an ancient pueblo that dates back to 1200 AD. After the tribe abandoned the pueblo, Spanish settlers occupied the area. A test of the wood in the current structure shows a cut date of 1740-1767. The home is small which makes for a quick visit. It has only a couple of rooms and some signage to explain the history of the building and the neighborhood. The oldest church in the USA is just around the corner from the oldest home. 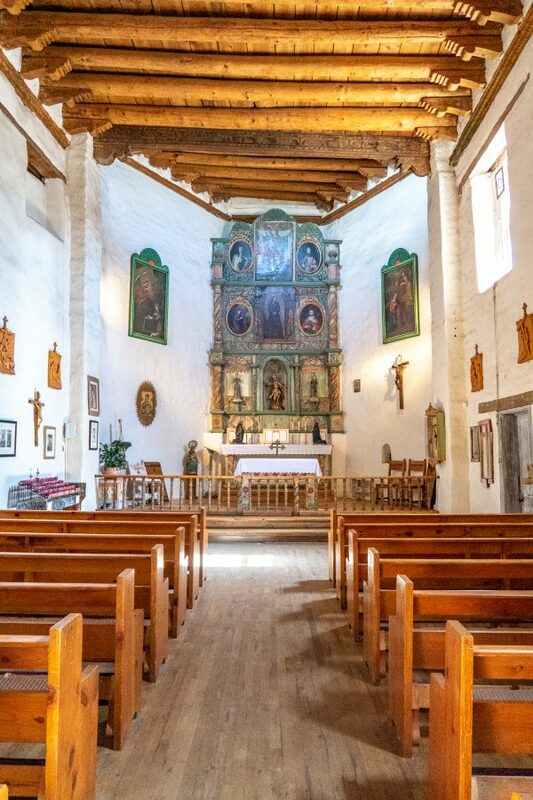 The adobe church was built between 1610 and 1626 as a place for soldiers, laborers, and Indians to worship. Later it served as a chapel for Spanish soldiers. The structure has been rebuilt several times and it once had a triple tower but the top two sections fell during a storm in 1872. This cathedral is an architectural landmark in downtown Santa Fe, just outside the Santa Fe Plaza. 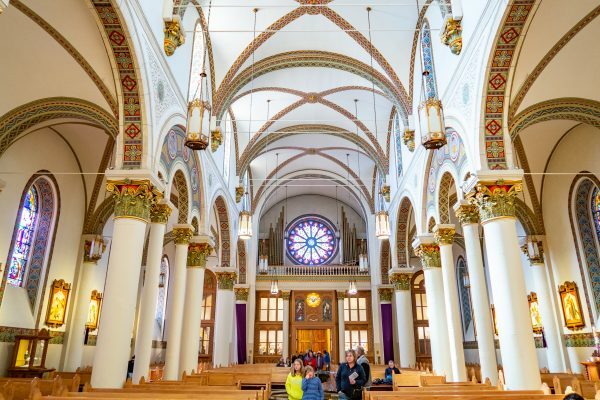 The cathedral combines classic European architecture with Southwestern style. The columns, archways, and rose window are classic design elements found in cathedrals in Europe. The brightly colored geometric patterns that decorate the space place the cathedral in New Mexico. This National Historic Landmark is the center of downtown and the center of the action. 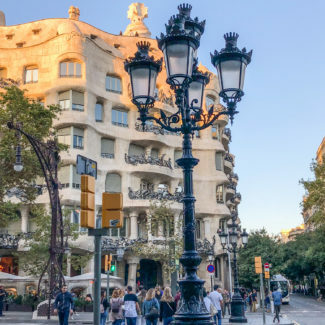 The plaza is lined with art galleries, shops, and restaurants. It’s an area that you just can’t miss. 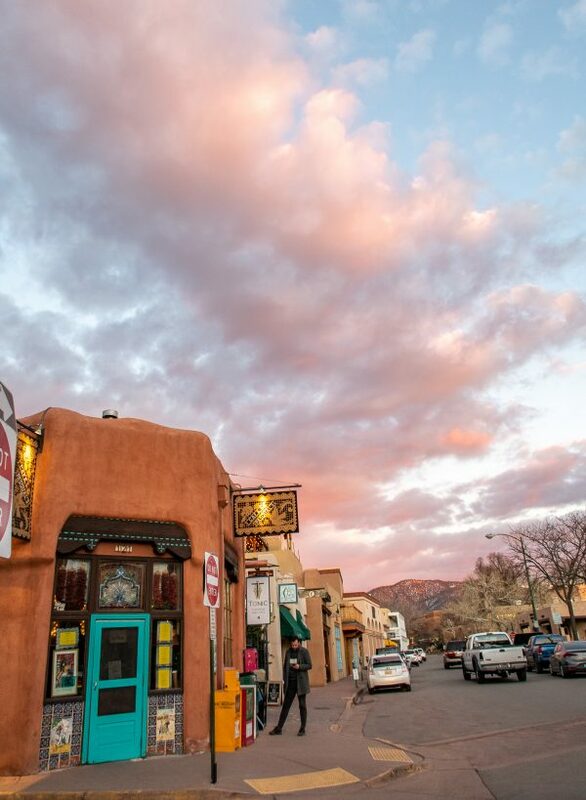 Santa Fe has over 240 art galleries and the small city has long been a destination and home for artists. Santa Fe is home to three arts districts: downtown, the Railyard Arts District, and the Canyon Roads Arts District. 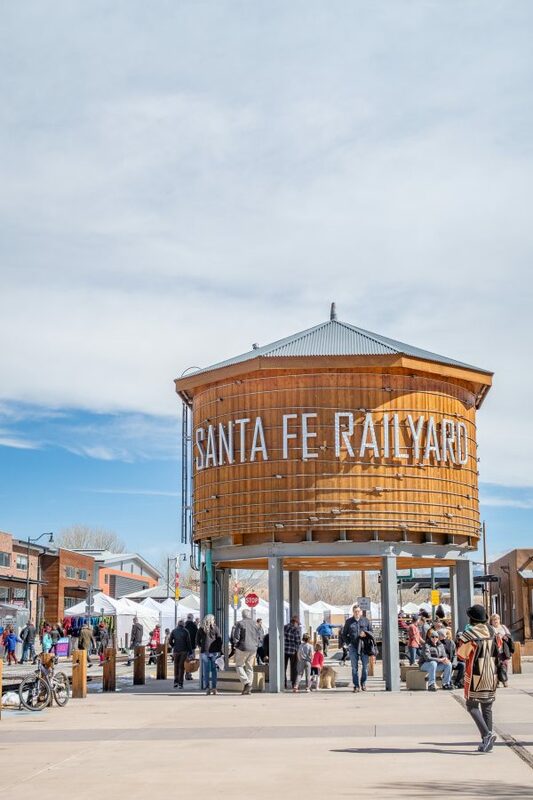 The Santa Fe Artists Market takes place in the Railyard Arts District on Saturdays from March to December. 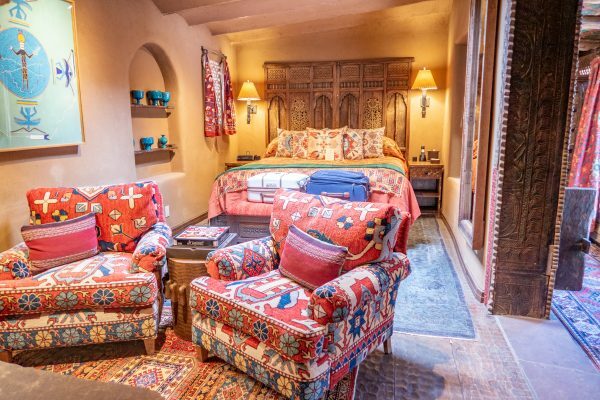 Santa Fe is known for its exceptional spas. We went to the spa at The Inn of Five Graces where we were staying but my New Mexican friend also recommends Thousand Waves, a Japanese style hot spring resort. 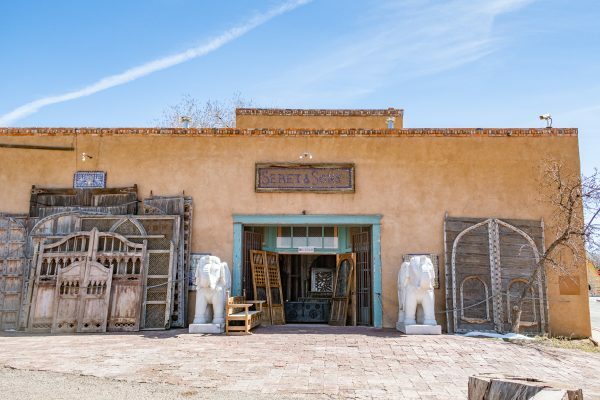 The shopping in Santa Fe is so good – especially if you like home goods and decor pieces! The photo above is from Wild Life, one of my favorite boutiques in downtown. The farmers market takes place in the Railyard Arts District on Saturdays. 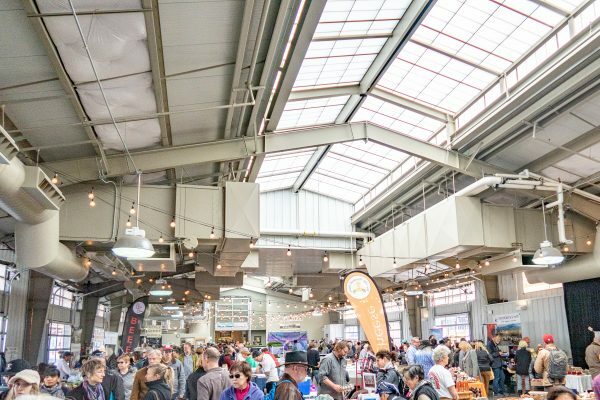 In the cooler months the market is smaller and indoors and in the summer the market it spreads into the outdoor space beside the train tracks. You can buy ristra wreaths, local honey, chile powder, meat, and produce. 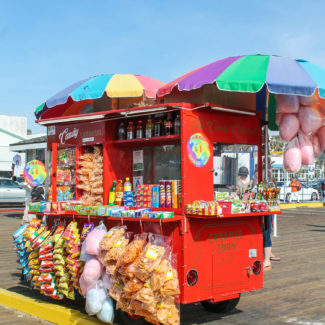 There are also food stands and I loved the pupusas. You will be amazed by the rugs, doors, architectural artifacts, and furniture in this massive store. 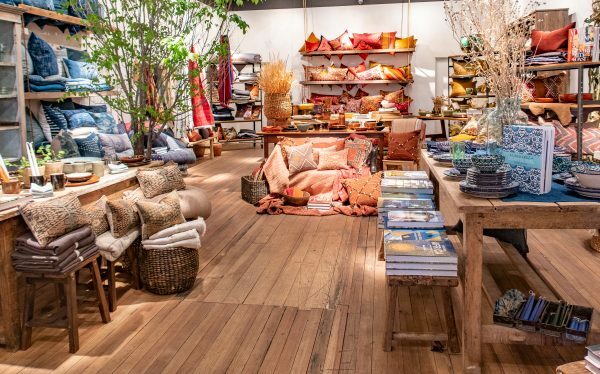 The owners Ira and Sylvia Seret work with local artisans to bring goods from India, Pakistan, Peru, and Tibet to America. It’s a fun place to explore. We stayed at the Inn of Five Graces which is owned by the Seret’s and this photo of our room gives you an idea of what you will find inside the shop. The drive between Santa Fe and Taos gorgeous. 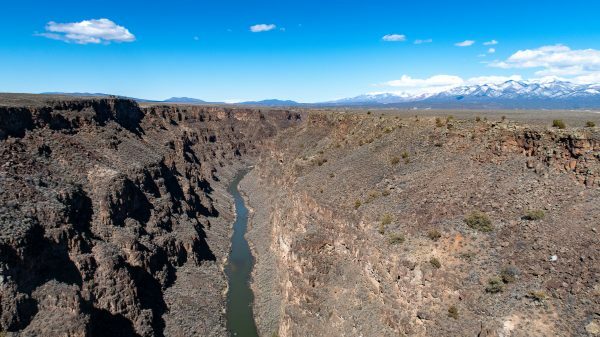 You will enjoy mountain views, stop to see adobe chapels, see the Rio Grande River Gorge, and drive through landscapes filled with rock formations. The food in Santa Fe is crazy delicious. Here are the restaurants that we tried and loved. I recommend making a reservation in advance at this James Beard Award Winning restaurant. The restaurant is celebrating its 40th anniversary and is known for using local ingredients in New Mexican, Mexican, and Central American meals. I loved the Pupusa, a nod to the El Salvadorian kitchen staff and a popular food in Santa Fe. Eloisa puts a modern more fine dining spin on classic New Mexican cuisine. I had brisket enchiladas with green chile and black bean sauces. A casual rooftop restaurant with both indoor and outdoor space. Go for just a drink or stay and they the enchiladas. One of the most popular restaurants in Santa Fe, The Shed doesn’t take reservations, so be prepared to wait. They are known for classic New Mexican food like enchiladas made with red chile sauce and blue corn tortillas and margaritas. 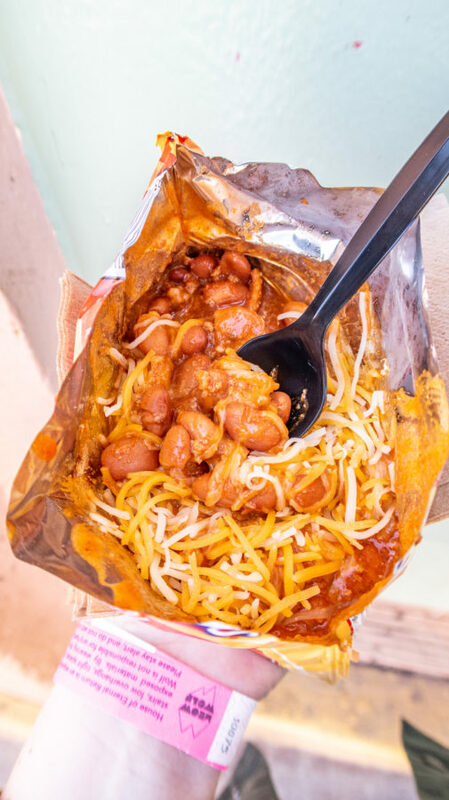 The small stand in the back of the Five + Dime is famous for its Frito Pie, which comes right in a bag of Fritos. 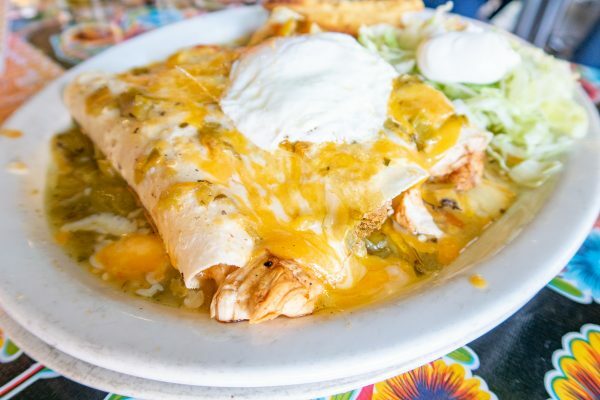 Another spot for classic New Mexican fare like enchiladas, tamales, chile rellenos, and huevos rancheros. Charles loved this low key bar and restaurant where locals hang out. He said their margarita was his favorite. The Santa Fe airport is very small and doesn’t have many direct flights. We flew through Denver, it was an easy direct path with a short layover. 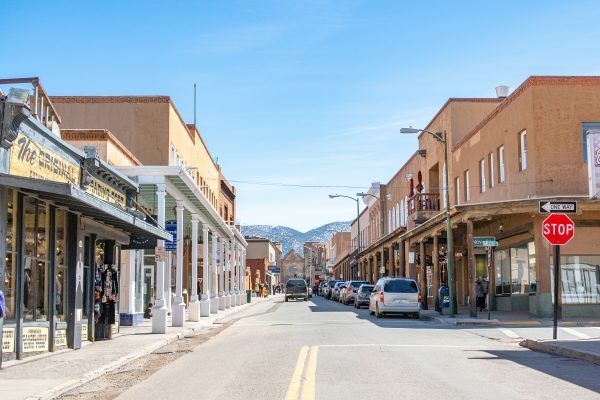 Santa Fe has an altitude of 7,200 feet (for reference Vail and Aspen are 8,000), so be prepared for a little altitude sickness. Drink extra water, drink less alcohol. Maybe have an afternoon cup of tea to fend off the sleepiness. It is colder than you might think. 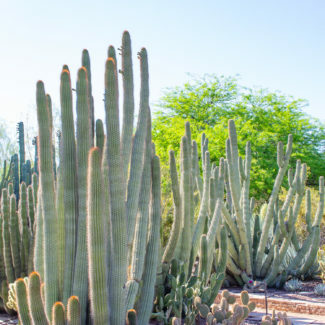 Santa Fe isn’t a hot desert. It’s a high altitude city where it snows. Check the weather before you go, and be prepared for the temperatures to drop at night. When we visited in March the temps were in the 40s. Our trip was four days long. 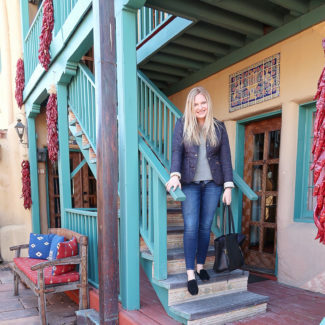 We spent 3 days in Santa Fe and we spent one day on a day trip to Taos. It felt like just the right amount of time. 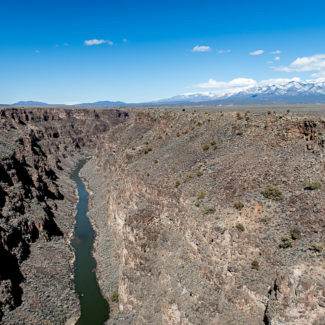 If you are a skier, the Taos Ski Valley is about 90 minutes from Santa Fe. If you are a golfer, there are lots of golf courses near Santa Fe.